Our family stopped at the Museum of North Carolina Minerals as part of our trip on the Blue Ridge Parkway. It's at milepost 331 near Spruce Pine, NC at Gillespie Gap. We arrived a few minutes after closing time and were disappointed that we couldn't go inside. There are some outdoor exhibits to explore so the stop wasn't a total loss. Mining is big in this part of the state. The boulders in front of the museum represent some of the minerals in North Carolina. Interactive displays inside the museum tell the rest of the story. We'll have to go back to see them. The site is also a visitor center for Mitchell County Chamber of Commerce, a gift shop and historic site. This part of western North Carolina was important to the revolutionary Battle of Kings Mountain. Historians call this battle was a turning point for the southern campaign of the revolutionary war. A historic marker near the building explains more about the battle and mentions some of the soldiers who fought. It's an interesting stop on the Blue Ridge Parkway. 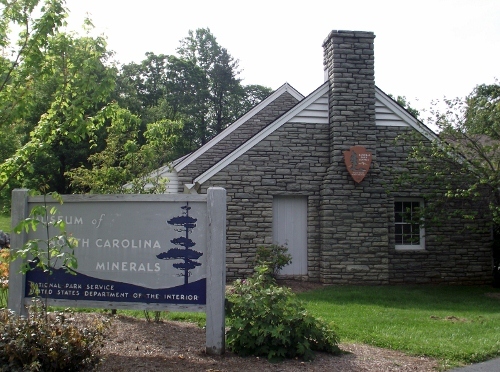 The Museum of North Carolina Minerals is open from 9-5, 7 days a week.